When a squirrel enters your house and eats your fig newtons, what to do? 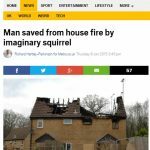 This article recounts one woman’s experience of a squirrel breaking into her home, turning on the water, eating her fig newtons, and then taking a nap in her bed. Moral of the story: don’t panic, call animal control, then find a way to keep them from coming back in! Posted in squirrels. 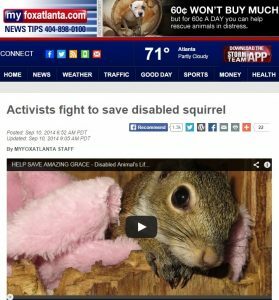 Tags: gray squirrels, pine martens, predation, red squirrels, research funding, squirrel curry, wildlife, wildlife photography, wildlife rehabilitation on February 16, 2015 by Mikel Delgado. A shockwave was sent through Britain when a man “photo-bombed” a news report, walking past with a dead squirrel. Later it was revealed that the squirrel is part of an upcoming comedy program, featuring comedian Kim Noble. I have to admit I’ve never heard of him, perhaps he is hoping the squirrel will give him his lucky break. Posted in squirrels. 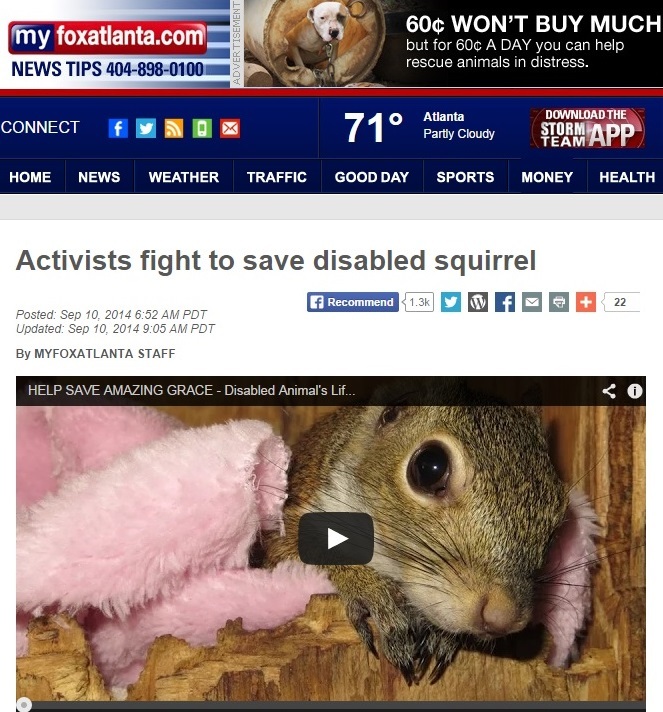 Tags: animal rescue, grey squirrels, pine martens, power outages, red squirrels on February 2, 2015 by Mikel Delgado. It's Squirrel Appreciation Day! 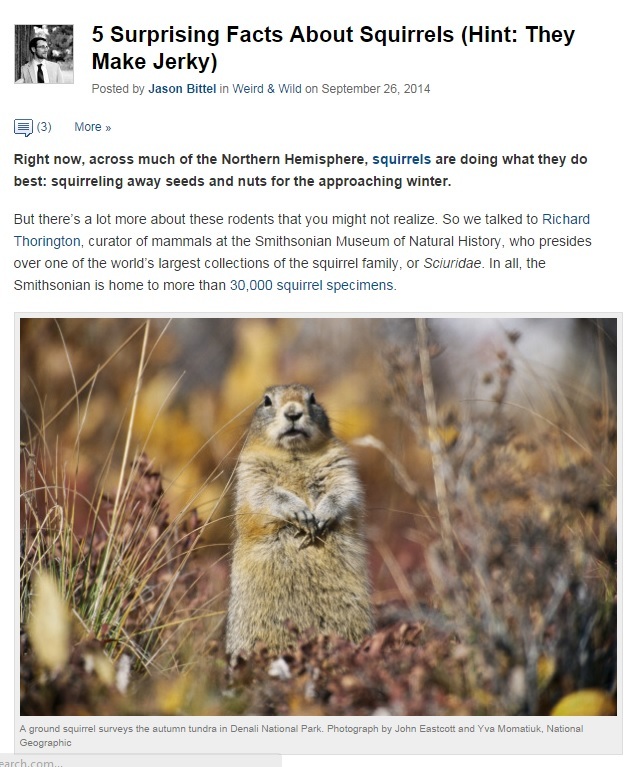 What could be better than getting caught up on all the latest squirrel news? 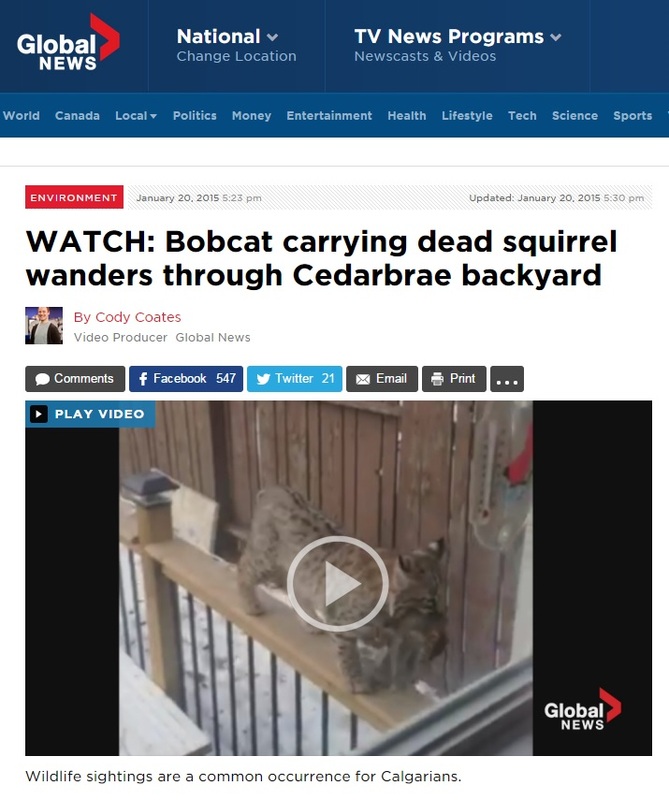 A man heard a sound at night that he dismissed as the pitter-patter of tiny squirrel feet. He went back to sleep and woke up when the sound was much louder and he realized that in fact his house was on fire. 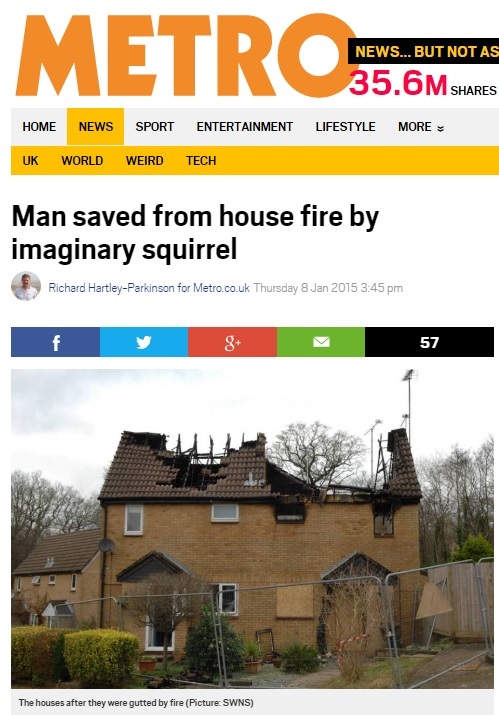 Luckily, he was not injured, although the home was a goner. In Omaha, Nebraska, an intoxicated man who was causing a disturbance told police he was on the run from a “pink squirrel with sharp teeth.” He was later taken in for psychiatric evaluation. Squirrel-related power outages recently happened in Redding, CA, Charleston, RI, Tampa, FL (again! ), Forest Park in Cincinatti, OH (leading the local high school to be dismissed early), Santa Clarita Valley, CA, and Kansas City, MO. 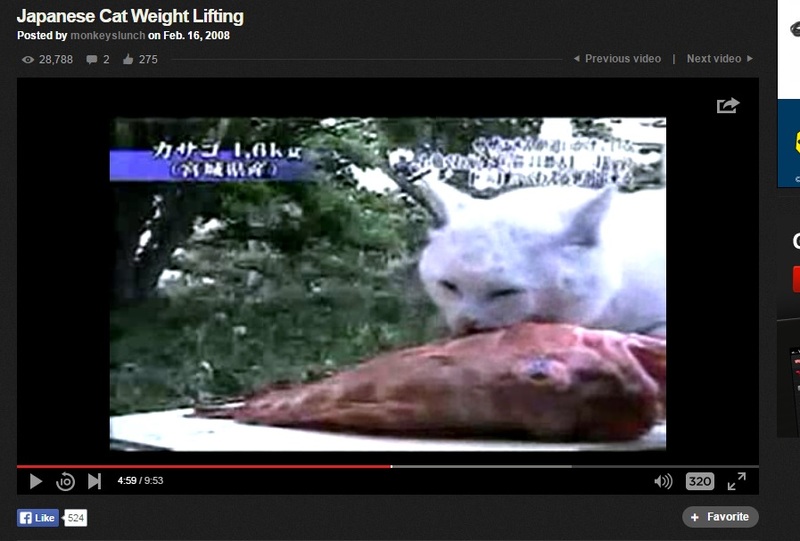 Eating squirrel is gaining popularity, it’s not just for J-Law and rednecks any more. The lean meat is supposedly gamey but tasty. I’m a veg, so I won’t be trying it out. You can even buy it on-line. The grey squirrel controversy continues, with the UK about to spend millions of tax payer’s money to kill grey squirrels in order to protect the endangered red squirrel. Some of that money will also go toward squirrel birth control. Some people are unhappy (at least about the cull, I’m not sure if the Catholics will opposed birth control for squirrels). Meanwhile Europeans fear a grey squirrel invasion of their own, with the French and Swiss up in arms about Italian grey squirrels hitting their turf (note, they are actually American squirrels who were brought to Italy many years ago). No we’re not talking about a sports event interrupted by squirrels, we’re talking about a competition designed FOR squirrels. This awesome British dude created an assault course in his back yard, the Squirrel Grand Nutional. 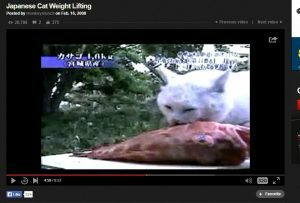 It’s almost as good as the feral cat fish-lifting competition. 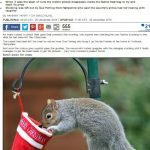 A little post-holiday joy, as if you haven’t had enough of santa, a cute squirrel playing with a stocking. 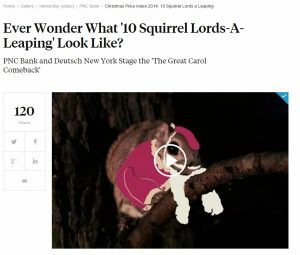 No, not the Republican-labeled "government pork" study - squirrels will eat from a giant horsehead mask, a squirrel head mask, so why not a robot mask? Watch a mama squirrel move her babies, then take a well-deserved nap. Have you ever been peed on by a squirrel? Twiggy the famous squirrel apparently loves waterskiing and water sports. Have you ever seen a squirrel tongue? The Irish News reported that this park squirrel “shocked” children by climbing all over them looking for food. I guess nothing shocks me much anymore. 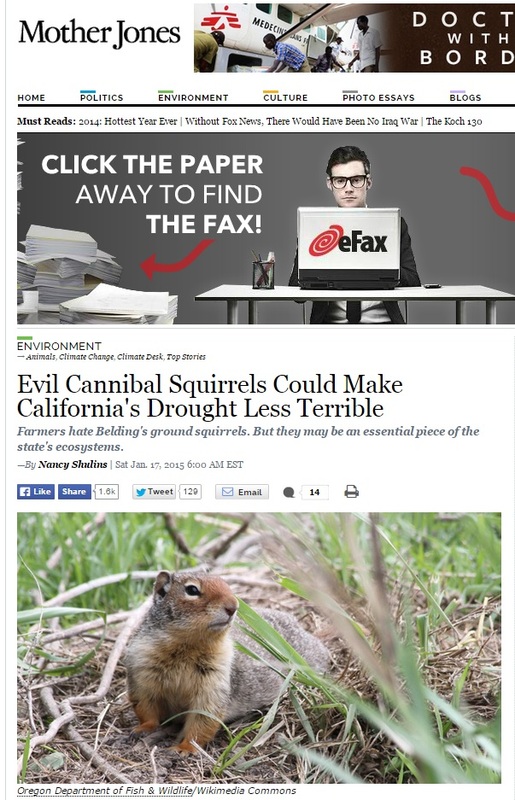 At least not when it comes to hungry squirrels. Look up! It’s a bird, it’s a plane, it’s a…squirrel nest! If you take a moment to look up, you will likely see a drey (a squirrel nest) or two dotting the trees. Watch these ground squirrels practice their evasive leap maneuver to avoid a simulated snake. These squirrels are known for throwing rocks at snakes, and perhaps even taunting them with their tail flagging. Who is predator and who is prey? Eagles chase this squirrel out of their nest – squirrels are known for making snacks of birds’ eggs. I’ve previously written about squirrel sweaters. Dita Von Teese (who is she again?) made a splash recently with this squirrel-skirt. 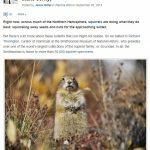 Belding’s Ground Squirrels – in decline – and eating each other? 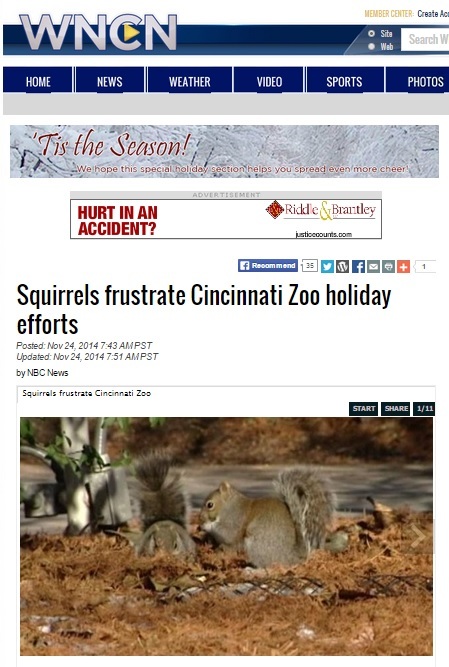 Note that this click-bait title is misleading, there is nothing about squirrels eating each other in this article. It does talk about the impact of climate change on this little rodent friend, and the impact of the BGS on the local crops. Posted in squirrels. Tags: assault course, Belding's ground squirrel, cat weight lifting, climate change, Dita Von Teese, dreys, grey squirrels, ground squirrels, imaginary squirrels, power outages, predation, red squirrels, Squirrel Appreciation Day, squirrel cull, Twiggy the waterskiing squirrel on January 21, 2015 by Mikel Delgado. A Russian squirrel took off with a baggie of drugs, teens chase, police get curious...you can't make this stuff up. Does this squirrel dress better than most college students? Sneezy the campus squirrel has gained notoriety (and much media coverage) for her high tolerance for being dressed in cute outfits. A "squirrel whispering" student at Penn State has even turned this squirrel's cuteness into an enterprise, including a Facebook page with over 25,000 "likes." Is this squirrel-sploitation or just ridiculously cute? Is this putting Berkeley squirrels to shame? Posted in squirrels. Tags: dreys, drugs, gray squirrels, Penn State, power outages, red squirrels, Sneezy the squirrel, squirrel nests, squirrel rescue, urban wildlife, wildlife rehabilitation on September 9, 2014 by Mikel Delgado.